The colors are pool party and island indigo with some basic grey on the first one, and those little ornaments on the bottom were done with a retired SU! punch and covered with Nuvo glitter. I used a silver paint pen to cover the tops of them. 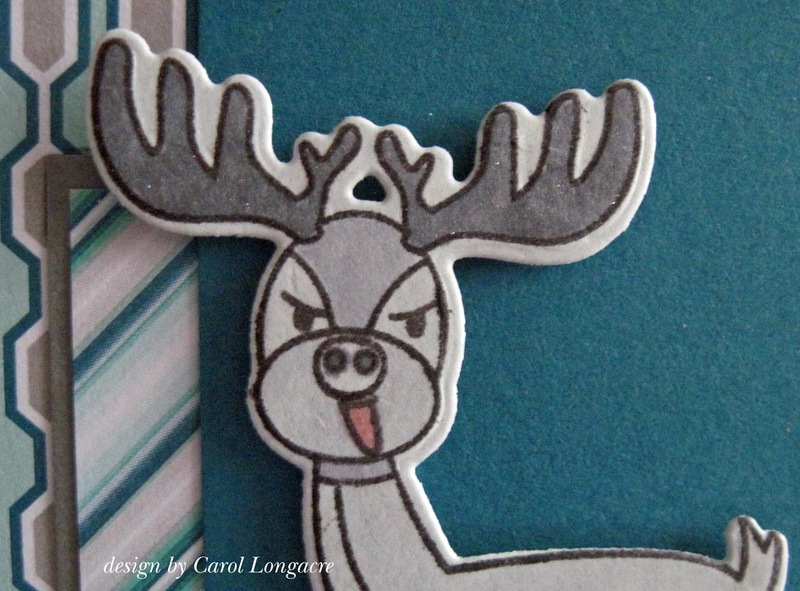 I'm sharing with the 2 Crafty Critter Crazies challenge #8 which is to use any critter on your creation. This will keep me laughing all day long - and probably into next week as well! First of all, I love your card and that design. So cute. The deer really grabs you. That sentiment is SO TRUE! LOL! Deer are really pretty but yes, pretty filthy when it comes down to it too. Fantastic card! I laugh every time I see his little tongue sticking out. I was an excellent purchase of a set. Great cards, and I bet they get sold quickly. Nuvo Glitter, huh? This is hilarious, I can imagine people laughing at the card stand. Wonderful papers too and love the baubles. These cards are so fun and surely you will sell both them! 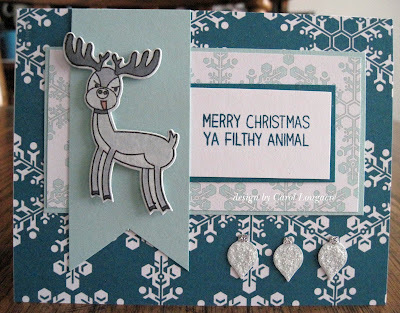 The reindeer looks great with that face and the elegant papers compliments very well the snarky sentiments! :D Well done! Super cards Carol, such a fun Reindeer and great sentiments. Can't stop laughing and I can't stop hearing the machine gun and the quote -- it's like a song that keeps playing over and over in my mind. Thanks for the chuckle and another great card, Carol. These cards are hilarious, Carol! Love the look on your deer's face and that saying just tops it! Great sketch and those pretty sheets of DSP are perfect! Way to use it up, too! 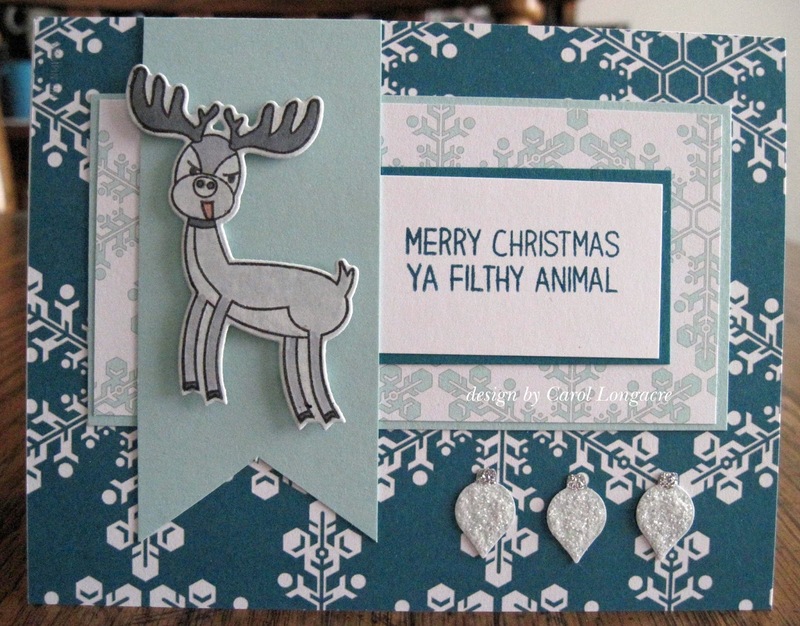 That is a hilarious card design and love those sentiments. They sure had me chuckling. 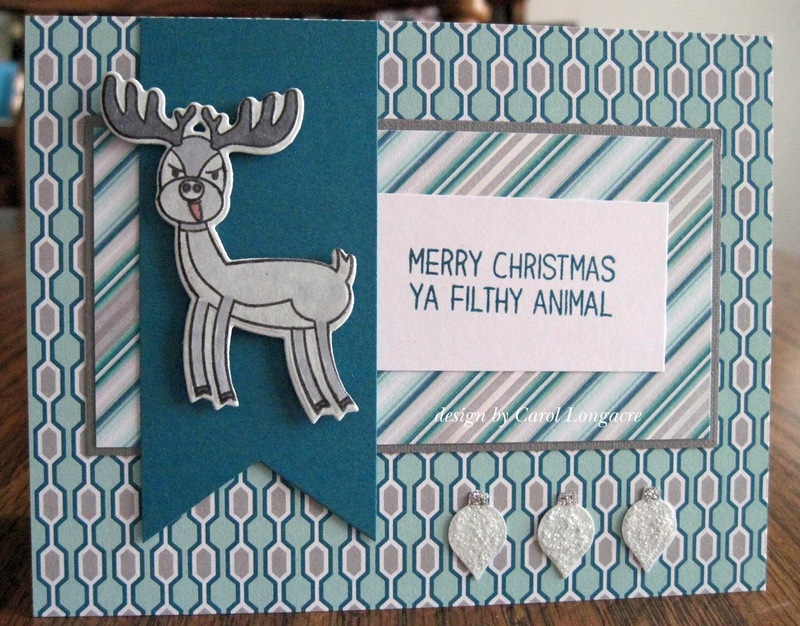 A super cute Christmas card. 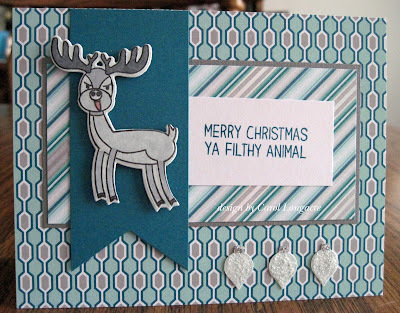 Love the reindeer and the papers you chose for this fabulous card.